I LOVE this bright pink skirt! While there’s every chance of it searing your retinas, when I spotted it in a Dotti store last year (it was hard to miss) I couldn’t resist snapping it up. I love how bright it this outfit is! 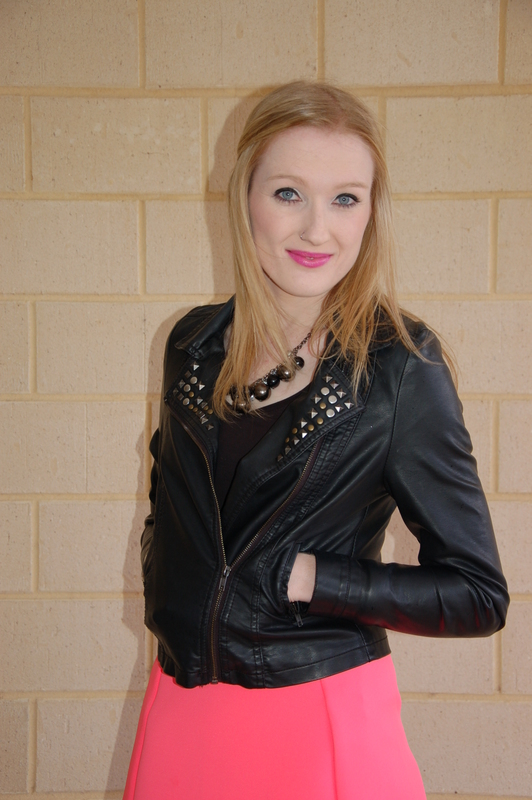 I’m a big fan of fluro pink in everyday outfits – my current handbag is a similar shade to this skirt. To balance out the crazy colour I paired this with a simple black tee, bag and a dark necklace. While a lot of style guides may say my sky blue flats are a bit much, they just felt really fun when I put them on with the pink. I also threw on a faux leather jacket with a studded collar that I picked up for only five dollars at an op shop! I like the mix of circles on my necklace and squares on the lapel. To finish it off I chose the brightest pink lipstick I own! This faux leather jacket has been a wardrobe staple for me. Jacket: op shop. Originally Ally. Lips: Maybelline Colour Sensational – fuchsia fever. What’s your favourite bright colour piece in your wardrobe? Haha hello! Yeah the shape makes all the difference! Thanks hun! It will get a lot of wear over summer!